1. Marinate chicken one hour in mojo. 2. Grill chicken on open flame grill, turning frequently: approximately six minutes per side (Option: if grill is not available you can bake in 400 degree F. oven approximately twelve minutes.). Cool. Dice into 1/4-inch pieces. 3. Place tortillas on clean work surface. Evenly divide chicken, plantains, tomato and green onions into each tortilla. Drizzle lime juice and (if desired) hot sauce. Top with two oz. cheese on each tortilla. Place another tortilla on top and press gently. 4. Preheat and non-stick pan until medium hot; then place oil in hot pan. Place tostada in pan; brown both sides approximately 45 seconds per side. 5. Place on a serving platter; serve with black beans and yellow rice (sour cream is an optional garnish for tostada). 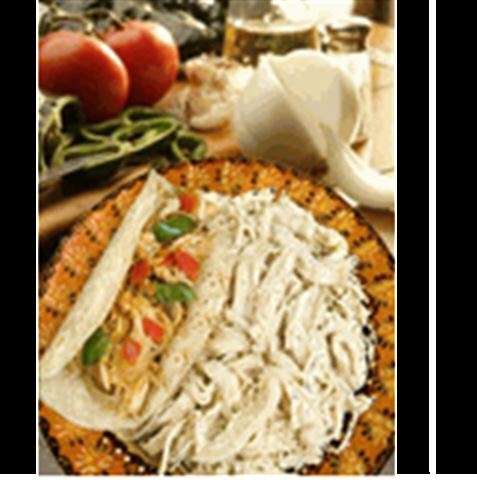 Enjoy this delicious chicken plantain tostada Mexican recipe!